This doesn’t fit me or my brand! What am I supposed to do with this? The answers varied, but it was always similar: a flat, one-dimensional psychological archetype that was supposed to encompass my brand and make customers flock to me. Well I’m here to tell you that all those promises of a single brand archetype are BS! I’ve been designing websites and visual identities (logos and other brand collateral) since 2004 and I’ve seen clients get hung up on all kinds of things. They might have lack of focus where they are trying to be everything to everyone (except themselves), or chasing every single new shiny object that comes to their path. I’ve seen clients struggle with not making enough money because they don’t charge their worth, and I’ve seen clients sit on a site, ready to launch, because they can’t get over their fear of failure so they rather hide. To be honest with you, I’ve been there too with my business. Not too long ago, when I was feeling particular stuck and unmotivated with my brand, I did a few exercises that I often give to my own clients. I was searching for answers about where to take my brand next. Even though I have an agency with a small team, the business is my personal brand. I’m the face that customers connect with, therefore, my brand is me. I started with my values, my personal values. And part of my personal values is a strong element of spirituality and woo-wooness. I love everything astrology and moon related, I’ve loved it ever since elementary school when I first learned that I was an Aquarius. Your brand is written in the stars and your purpose is calling! Then it hit me, astrology, an ancient tradition, that all cultures have, is the original archetype and psychological assessor. Giving qualities and traits to different planets in the sky. And the day we are born, we are imprinted with a completely unique set of strengths, challenges, and callings that are written in the stars! In astrology, a person is a complex combination of different archetypes and unique abilities and motivations, all based on how the planets were aligned at the time of your first breath. Why wouldn’t brands be the same!? When I looked at my sun, moon and rising signs, from the lense of my personal brand, I saw an intricate constellation of a business! I assigned not one but 3 astrological signs (archetypes) plus a bunch of other secret saucy platentary and house positions to my personal brand and voila! I had the brand framework that finally made sense for my brand and I’ve been adopting this framework to client brands with amazing results! Hey baby, what’s your sign? When someone asks you this, they are asking about your sun sign. The sign that the sun was in when you were born. The sun goes through each sign of the zodiac in about 28 days or so. The core of your brand, your values, what you stand for, your ultimate strengths, what you do, this is all at the soul of your brand or business. You can look to your astrological sun sign for insight on your values. You can look to your strengths here to ensure that you’re using your star-given strengths to work in your zone of genius and creating top-notch work. If you’re not using your sun sign, you’re not standing up for anything, your brand becomes flimsy and weak. If you’re using your sun sign in your brand, you’re focused and laser sharp, and making great impact. But not to worry if you read up on your sun sign and you’re like this isn’t really me… because you’re so much more than that! This is just the beginning. Like the sun, the moon was in a sign at the time of your birth. But the moon zips through each of the 12 signs of the zodiac in approximately 2.5 days. Your moon sign is the inner you. The you that people may not see but may get an impression. If you are not true to yourself, or your desires, or longings, by not being aware or not acknowledging your desires, you are unaligned and not showing up in your world authentically. These desires inform you on how much money you need to feel secure, how you want to be recognized, how you want to feel. Often we do not think of these things as being important to our brand, but we need to listen to our inner desires to show up truly and fully. If you’re not using your moon sign, you’re denying what your brand really needs and hiding, your prospects will feel this. If you’re using your moon sign in your brand, you glow with the confidence that you know exactly what you need to succeed and you’re going to get it. Your customers will feel your truth. Like the sun and the moon, your rising (aka ascendant) horizon takes place in one of the zodiac signs. Even quicker than the moon, the rising sign changes approximately every 2 hours. Your rising sign is the archetype that you present to the world, your outer brand or your brand personality. This is the brand with whom your customer will first interact. This is your first impression and you only get one chance. The rising sign’s personality informs the language and style of your brand. Your brand voice and look. If you’re not using your rising sign, you’re not connecting with your customers and staying really small. If you’re using your rising sign, you are like a magnet to your customers, you don’t have to try or strive to sell or market. You get out there in your authentic way and your tribe is drawn to you. And this system works for brands that are more than personal brands. For a brand or business that is larger and made up of a culture rather than an individual, we can still read a chart for the brand based on a point in time where the brand first drew its own breath, like the signing of a lease,or the registration of a domain name, or the signing of an LLC. When you are really aligned with your core brand, inner and outer brands, your brand becomes a beacon shining the light on your brand journey and guiding you to where you are supposed to go. Where does your brand feel unaligned? Imagine what looking at your astrological chart could tell you about what’s already written in the stars for your brand! Ready to stop working outside your element and get astrologically aligned? Check out my free mini video training Super So(u)l Activator. I’ve been designing visual brands and websites since 2002 and a lover of all things astrology since I first found out I was an Aquarius in elementary school. Earlier this year, I felt stuck in my business and decided to take time to reflect and do brand archetyping exercises that I normally reserve for my clients… but something wasn’t working. In classic brand archetyping, you choose one archetype and this one-dimensional brand just didn’t fit, nor inform me on how to move forward. The aha moment came when I realized that in astrology, we are made up of different signs and archetypes that create a combination that makes us uniquely US… so it makes sense that brands must have a special divine combination too! 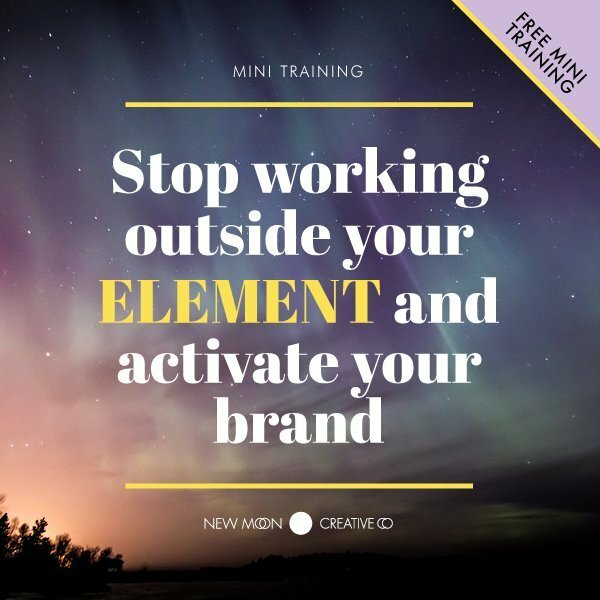 This realization led me to create an astro-branding system that becomes the North Star for your brand, shining the light on where to go and how to get there. I’ve used the system and it has reignited my business with inspired action to move forward. I want to share this astro-branding framework with you too!